We worked with the Irish Government on a major user centred design initiative to deliver enhanced digital services to all citizens of Ireland. This multi-faceted project required our team’s skill and experience in interaction design, interface design, and digital transformation. Being ‘Digital First’ is a primary objective in the government’s Public Service ICT Strategy. In support of that objective, this portal promotes the delivery of innovative digital services to all Irish citizens. Within the Public Service, this portal is understood as playing a significant role in increasing the profile of, and facilitating improved access to, all such government digital services. D/PER commissioned Frontend.com to help them deliver a site which would provide services, information, and guidance to all users in a clear, understandable, and accessible manner. Our team worked in partnership with senior D/PER stakeholders to define, refine, and realise a user-centred design for all Irish citizens. We conducted a series of one-day Innovation Workshop sprints with key senior stakeholders from D/PER’s Office of the Government Chief Information Officer, along with representatives of some of the first Departments being on-boarded to the platform. We used these design sprints to interrogate the scope of the site’s requirements and to devise wireframe flows for the complete end-to-end structure of the site. Example of our hand-drawn interaction design sketches for Gov.ie web pages. The most complex aspect of this process was defining one overall information architecture which would be able to accommodate the huge variations in pre-existing content from the seventeen government Departments and over 200 public agencies that would eventually be on-boarded. The balancing act here was to determine the most robust architecture that would accommodate the nuance of individual Department’s requirements without implying onerous content restructuring by Department personnel, yet which also imposed enough discipline and coherence to deliver a new level of consistent user experience across the entire government portal. 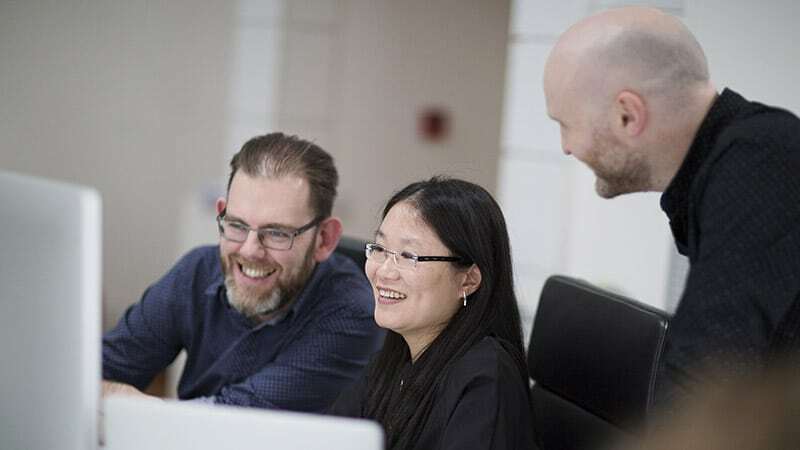 In this regard, our contribution also contributed to Digital Transformation, given that a core principle supporting the design of this new site was to encourage the move from Department-centric mindsets to a User-centric mental model across all contributors. The new Gov.ie portal is focused on the user and on their needs above all else. We gained a deep understanding of the range of material that would need to be supported, incorporated, and presented on the site. Then we produced multiple iterations of wireframes defining all of the classes of pages that the site would have to support. At the highest level, these include policies, consultations and organisations, in addition to government services. Our final suite of wireframes established a strong foundation for the structural work of the D/PER web development team who are constructing the site. 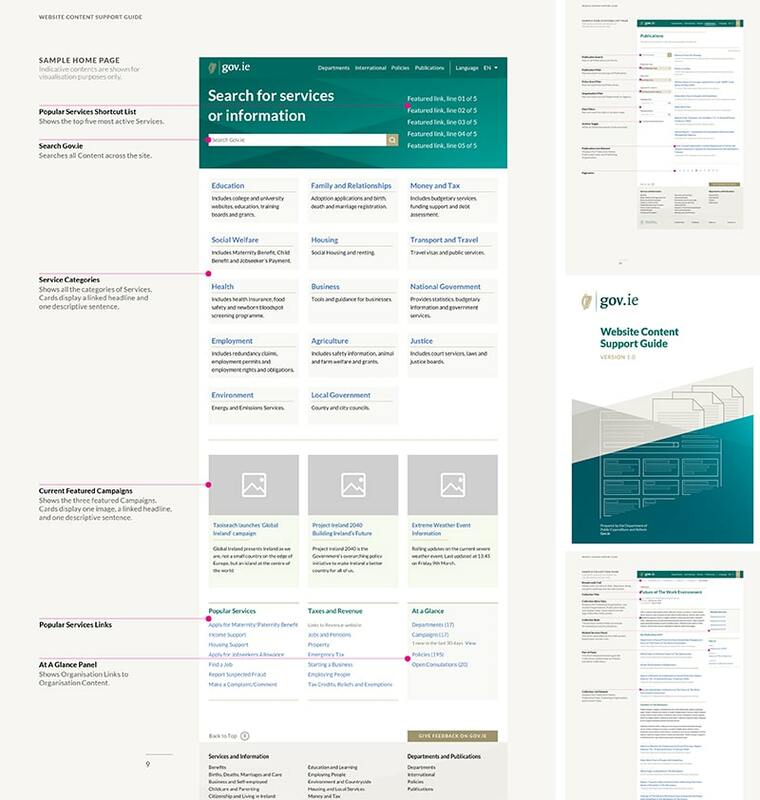 An example of our interaction design wireframes for Gov.ie web pages. This year the government have introduced a single unified brand identity for the whole Government of Ireland. This identity system removed the myriad of confusing individual Department and service brand identities which had accumulated over the lifetime of the State. All of these were now replaced and rationalised under the clarity of one definite master brand identity system. We extended the core principles of this new Government identity system into the digital space. 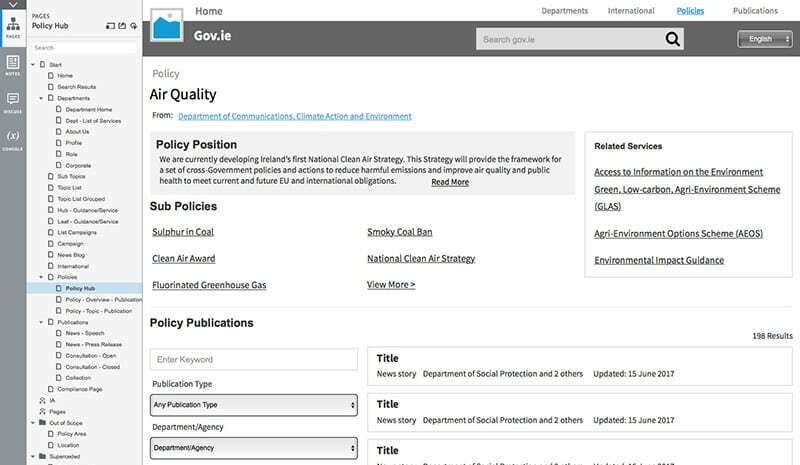 Our work clarified how the existing confusing array of inconsistent Department websites that users currently have to navigate would be transformed into one set of related and connected departmental presences on the Gov.ie platform. We defined how all would use similar content structures and interaction models under one shared visual design system so that users would have equivalent experiences when interacting with all Departments. 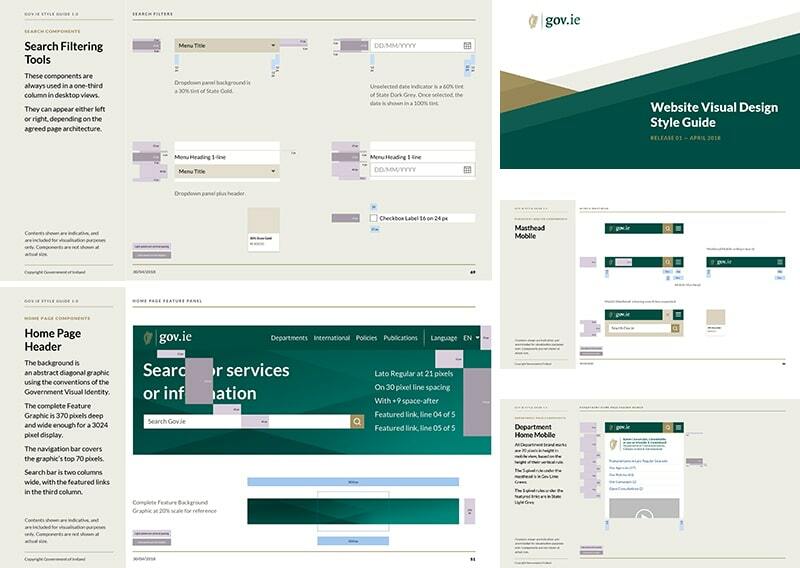 A selection of pages from our Gov.ie Website Visual Design Guide. Having a comprehensive site architecture for the portal, along with a fully realised visual system for designing each type of page was still only the beginning. For this site to become a reality, many thousands of web pages shall have to be produced. Over the coming years, hundreds of staff across hundreds of organisations will have to evaluate existing digital content and migrate it onto the new Gov.ie platform. To that end, we worked with the D/PER team to develop and produce a comprehensive Website Content Support Guide. This guide helps staff across every Department and organisation that needs to publish their services or information on the portal. The guide clarifies what content should be on Gov.ie, explains the different types of web pages, and shows examples of each. Its primary purpose is to help prepare all Departments and other public bodies for migrating their existing websites onto the Gov.ie platform. This guide also serves as a powerful lever for Digital Transformation across the Public Service, as it outlines a user-centric philosophy for delivering all services. We collaborated closely with the D/PER team in the initial definition of this guidance. This Content Support Guide will become a living document, one that shall grow and evolve as subsequent Departments migrate onto the platform. 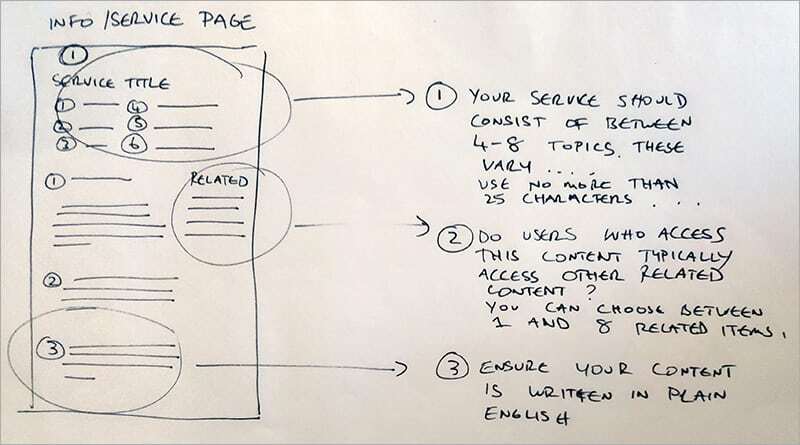 A selection of pages from our Gov.ie Website Content Support Guide. 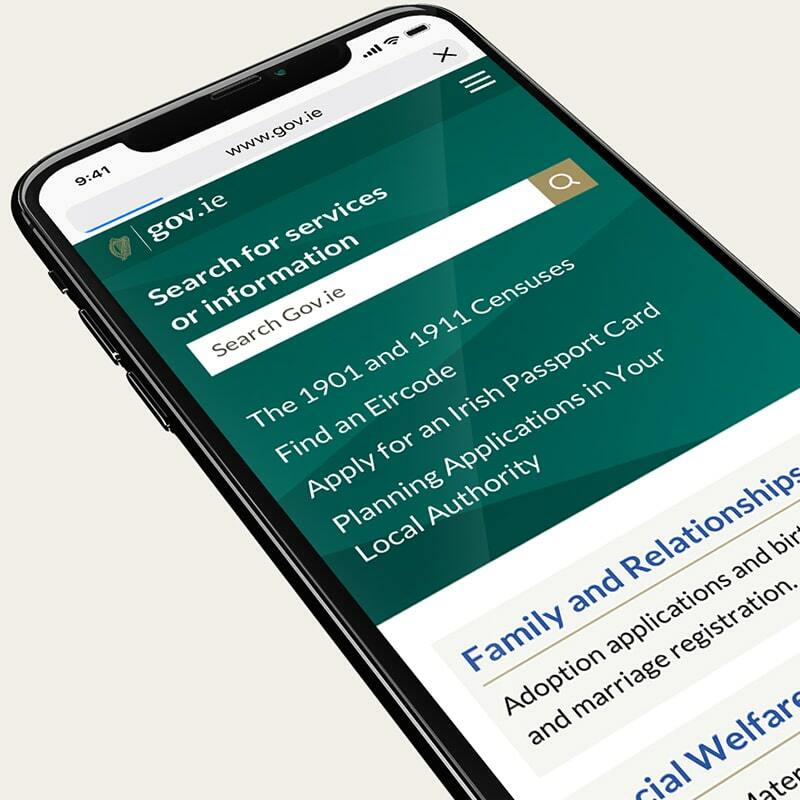 The enhanced version of the Gov.ie portal went live during the Summer of 2018. Over time more Departments, public information, and government services shall be consolidated onto this portal, making it easier for Irish citizens to interact with their government online. As all of those Government Departments and public bodies migrate to the new platform, the internal organisational benefits of one unified system shall be seen in the efficiencies that it will deliver in shared knowledge, training, and ongoing management. 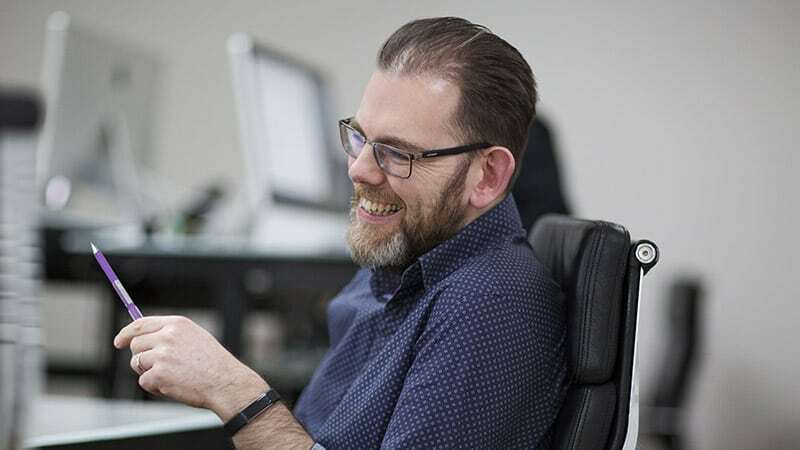 Frontend.com worked with the OGCIO, using their UX insight and expertise to help us produce a flexible information architecture for the centralised Government portal and a design system that we can now apply to almost any public site. Their contribution has not only helped us deliver on commitments contained within the national Public Service ICT Strategy, but has furthered our goals for digital transformation across public organisations.